As high blood pressure doesn’t tend to produce noticeable signs or obvious symptoms, those in mid-life who are unaware of their blood pressure readings would be well advised to visit their healthcare provider. Hypertension is a chronic, progressive, often silent condition that increases the workload of the heart and blood vessels, while decreasing efficient function. Each heartbeat forces oxygenated blood and life-supporting nutrients through the circulatory system to all tissues and organs, exerting pressure on blood vessel walls. When blood pressure remains consistently high, extra strain is placed on the heart and the arteries, weakening and damaging the heart, vessel walls, and organs over time. Because high blood pressure is a known risk factor for cardiovascular disease, renal failure and premature mortality, blood pressure should be measured at regular intervals. Ideally, we should all strive to keep blood pressure readings below 120/80. It is generally recommended that adults with higher levels take steps to lower or prevent blood pressure from rising any further. Small amounts matter, as those with levels of 135/85 are twice as likely to have a cardiac event or a stoke than an individual with a reading of 115/75. Perhaps more importantly, new findings from a longitudinal observational study of over 8,000 men and women published in the European Heart Journal supports the hypothesis that high blood pressure at mid-life, but not late life, is linked to increased risk of cognitive decline. The study examined the associations of blood pressure at age 50, 60 and 70 years old. 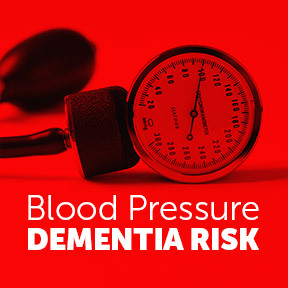 After controlling for risk factors such as health behaviors, stroke, heart failure and other cardiovascular diseases, the researchers found that at age 50, systolic blood pressure of 130 or greater was independently associated with a 38 percent increased chance of developing dementia. Although a reading of 140 is typically the point where hypertensive medication is recommended, many don’t follow through on taking medications as they often have no symptoms. Yet the potentially damaging strain that high blood pressure places on vessel walls is not limited to the heart; it also affects small vessels in the brain. Vascular risk factors are believed to be a primary cause of dementia, even more so than genetics. As neurological alterations related to hypertension are typically diagnosed after cognitive deficit becomes evident, it is often too late to halt progression of pathological processes. In studies, individuals with hypertension tend to score lower on cognitive tests than those with normal blood pressure. The findings are clear that uncontrolled hypertension can lead to a series of small strokes, as well as kidney, retina and brain damage over time. In 2017, the American College of Cardiology updated their guidelines for the management of high blood pressure, including pharmacological and lifestyle interventions. Low-risk adults with elevated blood pressure of 120/80 to 129/80 should follow heathy lifestyle guidelines and have their blood pressure evaluated every three months. Nonpharmacologic modifications to reduce BP include: weight loss for overweight or obese patients, a heart healthy diet, sodium restriction and potassium supplementation, as well as increased physical activity with a structured exercise program. Women should be limited to a maximum of one standard alcoholic drink per day and men to no more than two. Steps should also be taken to moderate stress, increase fitness, get regular restful sleep and to definitely not smoke. To accommodate the variety of important issues related to blood pressure management, adults with a high average reading should carefully monitor their vascular risk factors and see their health care provider for follow up. HTN Complex™ by Designs for Health™: This encapsulated formula provides an array of nutrients and herbs that naturally support blood pressure, vascular tone and cardiovascular health. Free of wheat, yeast, soy, gluten, eggs, dairy, corn, artificial colors, flavors, sugar, and preservatives. Non-GMO, vegetarian formulation. L-Arginine by Pure Encapsulations®: L-arginine supports nitric oxide formation, important for healthy blood vessel dilation, circulation and blood flow. Gluten free, Non-GMO hypoallergenic formulation. Please consult your healthcare provider before taking l-arginine, as l-arginine is contraindicated in certain medical conditions. Ubiquinol 200 mg by Healthy Origins®: On Sale This product supplies ubiquinol as Kaneka QH, an active antioxidant form of CoQ10 for enhanced bioavailability. Clinical studies suggest that CoQ10 has the potential to support lowered blood pressure. Free of gluten, wheat, sugar, salt, starch, yeast, corn, barley, soy, fish, shellfish, nuts, tree nuts, eggs, dairy, preservatives, and artificial ingredients. Non-GMO formulation. Hawthorne Max-V by Douglas Laboratories®: Rich in bioflavonoids, hawthorn extract has been used traditionally for centuries as a potent cardiovascular tonic to help support healthy cardiac and vascular function. Gluten, yeast, soy protein, dairy, corn, sodium, sugar, starch, and artificial ingredient free, vegan formulation. CoQ10 200 mg by Enzymatic Therapy: Essential for cellular energy, CoQ10 supplementation supports heart and brain health by replenishing levels that naturally decrease with aging. Free of gluten, soy, wheat, yeast, dairy, corn, sugar, preservatives and artificial ingredients. Vegetarian formulation. This entry was posted in Home and tagged Blood Pressure and Dementia Risk, CoQ10 200 mg by Enzymatic Therapy, Hawthorne Max-V by Douglas Laboratories, HTN Complex by Designs for Health, L-Arginine by Pure Encapsulations, Professional Supplement Center, Ubiquinol 200 mg by Healthy Origins, Vitamins and supplements, www.professionalsupplementcenter.com. Bookmark the permalink.